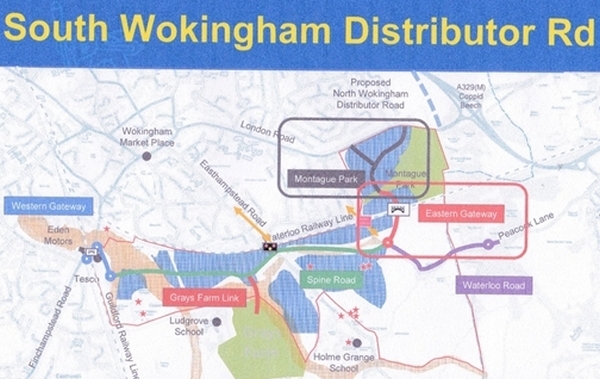 In the Summer of 2014 Wokingham Borough Council held a consultation about the preferred route of the South Wokingham Distributor Road (SWDR). A feasibility study looked at three possible routes for the road (a route to the north close to the Waterloo railway line, a route through the centre of the developments and a route in the south of the development area). This study has identified the central route as the technically deliverable route and also identified a need for improvements to the Peacock Lane link to Jennetts Park. Over 80% of replies, including that from the Society’s Executive Committee, supported this route, but with a variation (called option B1) as the road approaches the Finchampstead Road that had been urged by a number of local residents. The Council agreed to proceed with the chosen route, subject to analysing the technical feasibility of the B1 option. In September 2015 the Council announced that it and Network Rail had agreed early delivery of what is being called the Eastern Gateway element of the SWDR. This will secure funding to provide the bridge over the railway from Montague Park and continue the SWDR as far as Waterloo Road. Because that new connection will allow traffic to use alternative routes, the Waterloo Road railway crossing can then be closed as planned. Detailed arrangements for delivery of the eastern Gateway section were made available for public comment in July 2017, followed by a planning application in the Autumn. Completion is expected in Summer 2019. Design work is being carried out for the central and Western Gateway/junction with Finchampstead Road sections of the SWDR. There is as yet no timetable for consultation on and planning application submission for these sections, but the Council’s aim is to open the full SWDR in the Spring of 2021.